I hear the question often, “So, do you take a break during the summer?” I always hesitate before answering. On the one hand, yes—the summer semester is different; the pace is different, and the temperature is different. We have fewer students in the hallways, and many faculty and staff use the summer for vacation, professional conferences or research and consulting projects. So, yes, summer feels different. On the other hand, no; summer is not a break. Quite the contrary, summers are very busy. We do office moves and classroom improvements in the summer. We make upgrades to our infrastructure, and we close out the fiscal year budget and begin another. We complete annual reports and other administrative tasks. We also try to spend time getting out, visiting our alumni and friends. So, summer is busy; it’s just a different kind of busy. I say this because it’s important that our friends, alumni and supporters, know we are here, doing what we do, even in the summer. Indeed, on virtually each and every day of the year, something is happening in this college that improves opportunities for our students, expands the reach and expertise of our faculty, and strengthens the impact of our programs. Almost every day, we are working to find new and better ways to promote learning. We are working to discover new and better answers to the questions of tomorrow. We are working to craft a new and better ecosystem in which to serve the business community and to inspire innovation. Continuous improvement is not just a competitive necessity; it is at the root of our identity. It’s one of the things that makes this place so special, and another reason it’s great to be a Georgia Southern Eagle! Jason Hoynes (IS, 2002), a web hosting administrator at Assurant, has always been interested in information technology and has worked on computers since he was very young. He credits the Georgia Southern University College of Business with helping him turn that fascination into a career. With the constant interaction and focus on computers in daily life, many careers focus on technology. Jason’s information systems degree, however, has prepared him to turn cutting-edge technology into a competitive advantage. While at Georgia Southern, Jason learned how to relate to the human resources team, how to talk to accounting and legal departments, and how to assist marketing teams. In addition, he learned that, although the data a business relies on take many forms, having a clear and accurate representation of that data is the most important part of sound decisions. According to Jason, when he can effectively communicate with every part of a business, it gives him an advantage to make projects successful. Jason admits that, while he was taking his systems analysis and database courses at Georgia Southern, he thought they were the absolute hardest topics in the world, but he learned so much that now database has become his favorite topic. As a web hosting administrator, Jason works with a variety of technologies and coordinates with dozens of other people to make sure that everything runs smoothly. His workdays are filled with tasks from exploring ways to make a database run faster to working with other teams on routing and configuration. When someone goes to a website, he or she expects it to work. The visitor does not care that a server crashed or that someone has dug up the fiber-optic cables to the building. Through their responsibility for backups, disaster recovery and everyday maintenance, Jason’s team makes sure websites work. Jason says that it is so easy in the technology sector to become stagnant, but technology changes so quickly that failing to keep adapting will make even what experts know obsolete. To that end, he tries to read a technical paper or review every day. Jason enjoys the challenge of learning new ways to tweak the technology he uses every day to do something innovative. He gets a great sense of accomplishment when he learns to solve a problem that has been going on for some time and then realizes he can use that knowledge to solve someone else’s problems, too. Although Jason admits that, prior to the birth of his daughter Annabelle (2 years old), he thought his greatest accomplishments were related to his career and the respect he has earned in conjunction with that, but he now believes those are nothing compared to his family. Though parenting a toddler does not leave a lot of spare time, Jason and his wife, Schuyler (MBA, 2004), are active in the Georgia Southern alumni group. 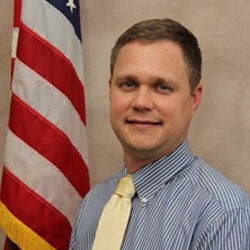 He was on the alumni board of directors for three years, and Schuyler is a current board member. In addition, the couple plans several alumni events around the Atlanta area each year as they remodel their home one room at a time. Jason believes this is a very exciting time to be a College of Business alumnus. Many changes are going on in the college, and he looks forward to being a part of them. Recently, he and Schuyler purchased a game-day condo to make it easier to make trips back to the ’Boro. In the future, Jason hopes to open his own technology consulting firm, a challenge he is anxious to conquer. 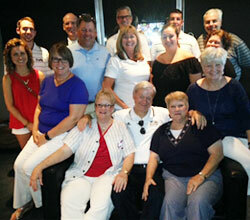 On the evening of Saturday, June 25, 2016, College of Business Dean’s Advisory Board Member JT Marburger hosted a group of alumni in his suite at Turner Field for the Braves vs. Mets baseball game. A good mix of alumni of all ages joined JT and Dean Allen Amason for an evening of good conversation and exchanged some favorite memories from their days on campus. If the Braves had won the game, it would have been a perfect evening. Thanks, JT, for your generosity! 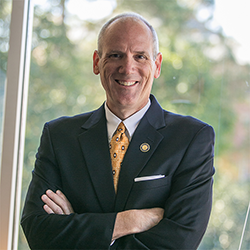 Jaimie Hebert, Ph.D., assume[d] his position as Georgia Southern University’s 13th president [on July 1, 2016]. Hebert not only brings to Georgia Southern extensive academic experience and leadership but also an enthusiasm for Georgia Southern’s commitment to academic excellence. In his first hundred days as president, Hebert is gathering information and ideas by asking students, alumni, faculty, staff and the community to complete a survey to share their thoughts on Georgia Southern, and identify what they feel should be his first priorities. Prior to this role, he served as provost and vice president for academic affairs at Sam Houston State University in Huntsville, Texas, where he spent the majority of his academic career. After joining the faculty there in 1999, Hebert was promoted to associate and full professor, served as chair of the Department of Mathematics and Statistics and [was] appointed dean of the College of Arts and Sciences before moving into the provost position in 2011. 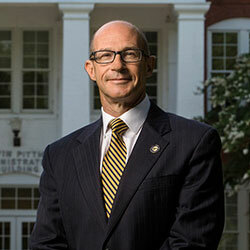 During his tenure as provost, Hebert initiated academic organizational changes to increase effectiveness and efficiency. He led the establishment of the College of Fine Arts and Mass Communication, the School of Nursing, three new departments in the College of Criminal Justice and a new College of Health Sciences. Under his direction, Sam Houston State added several doctoral, master’s and undergraduate degrees, and he played an integral role in securing gifts of more than $35 million for academic programs. Hebert served in a variety of leadership roles at Sam Houston State, including co-chair of the Strategic Enrollment Planning Committee and chair of the Faculty Evaluation Committee, Faculty Grievance Committee and Athletic Advisory Committee. He also served on a SACSCOC Compliance Committee, Faculty Senate, the Standing Faculty Tenure Committee and the Texas Success Initiative Committee. Prior to joining Sam Houston State, he was an assistant professor of mathematical sciences at Appalachian State University in Boone, North Carolina. For three consecutive years, he was nominated as a Student Government Association Outstanding Teacher. A native of Louisiana, Hebert earned his bachelor, master and Ph.D. degrees in statistics from the University of Louisiana–Lafayette and has worked extensively in statistical research. He has published in such journals as Communications in Statistics, Quality Engineering, Journal of Applied Probability, The American Statistician and Psychological Reports. He has received more than $2.5 million in external funding as principal investigator or co-principal investigator. The new Georgia Southern president was an active member of his community in Huntsville, where he served as president of the Huntsville Rotary Club, on the board of directors for [the] Huntsville Girls Softball [Association] and on the Huntsville/Walker Economic Development Committee. In addition, he regularly conducted workshops for new provosts sponsored by the American Association of State Colleges and Universities. President Hebert continued the Georgia Southern University summertime tradition of cutting watermelon for all on campus to enjoy on Friday, July 8. The tradition dates back to 1948 when late President Zach Henderson wanted to provide a cool treat to the students, faculty and staff who were still on campus during the hot summer months. Now, more than 200 watermelons are put on ice a week in advance for the annual watermelon cutting. Mike Cummings (MGMT, 1974) has been inducted into the Georgia Southern Athletics Hall of Fame. 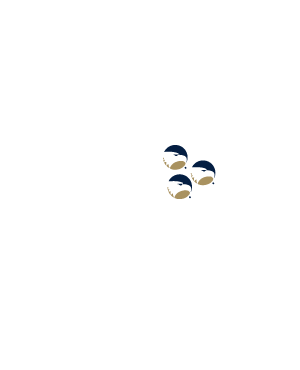 Mike has served as a board and Executive Committee member of Southern Boosters as well as the Georgia Southern Athletics Foundation since the 1980s, president of Laurens County Eagle Club since 1995 and on the Georgia Southern University Foundation board of directors from 2003–2007. In addition, he received the SOCON Distinguished Service Award representing Georgia Southern in 2009, contributed to the Ted Smith Family Football Operations Center, co-chaired the first Georgia Southern football game, which took place at the Shamrock Bowl in Dublin, Georgia, in 1981, and leads the yearly fundraising tournament for golf programs in Dublin. This month’s BIG Café varied a bit from previous months’ events, which allowed for a new business owner in town to present her business challenge and a brainstorming session about BIG Café and its format for the upcoming academic year. On July 13, 2016, Cora Barrs of Southern Cakes Bakery introduced her new business to fellow Statesboro entrepreneurs. She started by telling attendees how she worked about 80 hours per week for another bakery before deciding it was time to branch out on her own. On Monday, July 4, she held her grand opening with the intention of capitalizing on all those who went to Splash in the ’Boro for the day. In conjunction with her grand opening, she hosted a fundraiser to help a local family whose home burned down about eight months ago. Cora thoroughly loves decorating baked goods and is looking to expand the wholesale side of her business while finding her niche with events such as hosting birthday parties or teaching cake decorating classes in her 3,800 square-foot store across from Mill Creek. Currently, she has three wholesalers and would like to increase that number to eight. The wholesale side of her business is imperative so that she can do the part she loves—decorating. Cora is using word-of-mouth marketing and delivers a dozen cupcakes to at least four different businesses each week to help get her name out in the community. Other marketing suggestions given to her were to get involved in First Friday, the Farmers Market and opportunities on the Georgia Southern campus such as ‘Boro Browse. Another BIG Café attendee suggested focusing on one thing at a time, starting with doing what she loves first, as far as growing her business goes, to eliminate confusion among her target audience. Another attendee mentioned taking advantage of the trending Pokemon Go app and creating a lure that brings people playing the game to her store. Cora’s differentiator is hosting parties and cake decorating classes which is what she plans on focusing on once she secures a few more wholesalers. BIG Café is a monthly networking event held by the Business Innovation Group (BIG) on the second Wednesday of each month. BIG Café is for all entrepreneurs, from Statesboro to Augusta to Atlanta and beyond. As entrepreneurs present, attendees give feedback to help the presenting entrepreneur solve a problem they are experiencing and enjoy a complimentary cup of coffee provided by Cool Beanz. If you would like to present your business obstacle(s) at BIG Café, please contact Jill Johns at jjohns@georgiasouthern.edu or (912)478-0872. Attend the next BIG Café if you would like to come together to network, drink coffee and help one another thrive. Also, attend five times and you receive a free BIG Café coffee mug! Help us stay in touch with you! Simply visit GeorgiaSouthern.edu/Alumni and update your contact information.